Nicole Fitzsimons Foundation are proud to announce a further five grants have ben awarded in 2016. Nicole enjoyed family ski holidays when she was not in ballet. 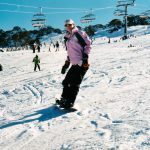 All boys are passionate skiers and David is a snowboarder and are extremely excited to be selected in the Australian team. Although, they have disabilities it has not held them back from doing things they love with support of devoted family. Skiing is an expensive sport and the boys all have part time jobs to save for their skiing equipment, ski passes and training. Competing at the Special Olympics Games is an event the boys will remember always. Nicole Fitzsimons Foundation are honoured to assist the boys and look forward to following your journey in Austria. Congratulations to Jade Charlton on receiving a Nicole Fitzsimons Foundation grant to assist with her fees at Queensland Ballet Pre Professional Year. Jade was diagnosed with ADHD at a young age and her mother introduced her to dancing to give a focus and use her energy positively. Jade loved ballet and had a natural talent and with the assistance of her medication was soon receiving distinctions in ballet exams. She was accepted into the Australian Ballet School Interstate Training Program at aged eight in 2007 and continued on this program for until 2014. Jade has much in common with Nicole having studied at Newtown Performing Arts High and then Sydney Distance Education as they followed their passion in dance. Both girls received distinctions in all RAD exams and performed Giselle in eisteddfods. Jade was bought up in Blacktown in a single parent home where her Mum, Deborah, worked hard and sacrificed time and money to give Jade the opportunity to dance. Jade worked at McDonalds to earn money, however, the travel to ballet classes on the North Shore and dancing six days a week, took its toll on her health. Jade was fortunate to win a Darcey Bussell scholarship to allow her to travel to London to compete in The RAD Genee Dance Challenge in 2015. Nicole also competed in thie prestigious Genee in 2005. Jade was accepted into 2016 Queensland Ballet Pre Professional Year and was fortunate to receive an Energex scholarship that paid half her fees. Her Mum, devoted to giving her daughter every chance of following her passion, took on an extra job to pay off the outstanding amount however she was not sure if she could continue to make ends meet. This is what inspired her to reach out to Nicole’s Foundation, and was overwhelmed with happiness and relief when told we would pay would pay half the outstanding balance. The Nicole Fitzsimons Foundation are proud to announce Jade Charlton as our 22nd grant recipient and wish her every happiness for the future. Jade, we hope that Nicole continues to inspire you to continue to stay dedicated to your dreams and doing what you love. All the best! Nicole Fitzsimons Foundation are proud to announce their first grant in 2016 to Laura Cattle from West Wyalong. Laura is the eldest of seven children and a talented and committed volleyball player. She received the opportunity to play volleyball and study for a degree in occupational therapy at Mount Marty College in South Dakota in 2014. Although,she does receive a scholarship it does not cover living expenses, sporting equipment and a low $A has made it difficult for Laura to continue to follow her dream. Laura works several jobs when she returns home including teaching swimming at the local pool. The Nicole Fitzsimons Foundation Board found many of Nicole’s qualities and passion in Laura and are honoured that we could offer assistance with payment for textbooks and volleyball equipment. We wish Laura every success as she follows her dreams in sport and study and that Nicole inspires her to always do your best. Owning my very own tandem, with sole thanks to the NFF, is a complete game changer! The past 18 months my only option for training and racing in Paratriathlon is through borrowing a tandem… and, although I am very grateful to have been able to borrow tandems, this created many obstacles. I can now plan my training sessions, schedule which races I want to enter, and race against my competitors on one of the best tandem bikes in the World. 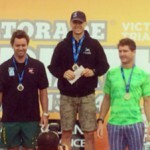 My Road to Rio has become an even BIGGER reality! The Nicole Fitzsimons Foundation is assisting Jonathan, a legally blind and hearing impaired para-triathlete, to achieve his dream of competing in the paralympics in Rio 2016. During mid 2013 we met Jonathan Goerlach, a hearing impaired and legally blind triathlete, who desperately needed a special tandem bike to train and prepare for his dream to travel to the Rio Paralympics. The funds to do this were way beyond Jonathan’s reach, so this is where the Foundation decided to step in and lend him a hand. Raising funds for the special tandem bike for Jonathan has been one of the highlights for the Foundation so far and after a long wait, Jonathan and the Foundation were extremely excited when the bike arrived from America. With his brand new bike, Jonathan has achieved improved results in his bike leg and after his performance in Penrith in early 2014, Jonathan and his have been selected as part of the Paratriathlon High Performance squad/program! This basically means he will be utilising everything the AIS has for elite athletes, and will travel to 2-3 international races this year. We look forward to continuing our support for Jonathan as he works tirelessly towards achieving his dreams to compete in Rio. The Nicole Fitzsimons Foundation assisting sister’s to follow their dream in field events. Our first recipients were talented & dedicated sporting sisters, Renee & Tanya Fassollis, who we met at Picton High School when presenting The Nicole Fitzsimons Award to a young dancer there. Tanya throws hammer & Renee is a champion in discus & javelin. These sisters were selling raffle tickets to raise money to attend the Australian Junior Athletics Championships in Perth in March as they were struggling to afford the air fares & accommodation costs so the Foundation gave a small grant to assist them with this. 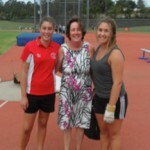 Last October in NSW All Schools Championships Tania won the U17 girls hammer achieving a personal best record. Renee won U14girls discus and 2nd in the shot put. What touched us dearly though was the bond these sister’s share & their pro-active attitude of trying to raise the funds to enable them to follow their passion & compete interstate. They were not going to let their circumstances stop them for following their dreams- and that is what this foundation is all about. The Nicole Fitzsimons Foundation providing ballet lessons for Fleur while her mother Helen is fighting pancreatic cancer. 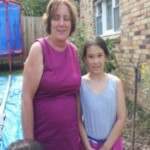 During March 2013, Fleur, a ten year old Melbourne girl was nominated by a family friend as her Mum, Helen, had terminal pancreatic cancer, and the family could not afford ballet lessons with the medical expenses. The friend met on Fleur on the set of the musical in Mebourne 2010. A few years on and singing, dancing, and all things stage remain Fleur’s passion. Her family is on the lower end of the socio-economic scale yet is full of much love & try to do all they can for their children. Heart-breakingly, Fleur’s mother has been recently been diagnosed with cancer, with tumours being found in her pancreas & liver. Currently the family is relying on a single income so are struggling to make ends meet. Being the most mature & responsible 9 year old, Fleur refused to go back to dancing classes so her family could save for the onslaught of medical bills. Yet her family friend spoke of how she will ‘never forget the glow on Fleur’s face when they were dancing together onstage’, and so she reached out to The Nicole Fitzsimons Foundation to provide any kind of assistance to assure that the girls passions for performing would not be held back during this incredibly difficult time. Immediately we knew that Nicole would be delighted to be able to help a young girl continue to do what brings her joy. So we contacted the local ballet school near where Fleur lives and paid for classes there for a whole year so Fleur can continue to enjoy her passion for dance, and we are proudly continuing to pay for her classes there this year as well. 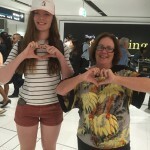 The Nicole Fitzsimons Foundation proudly assisting country-girl Eliza to follow her passion for cricket all the way to Holland! The Nicole Fitzsimons Foundation recently awarded 18 year old, Eliza Bunner from Baradine in north west NSW, a cricket kit to take to Holland where she will play and coach at Kampong Cricket Club during European summer. Eliza lost her mum when she was 5 years old to a brain tumour and has a twin sister with cerebral palsy. She is a gifted and passionate cricket player and has played in Baradine’s men’s first grade comp since 2008. In 2013 she played in NSW State State Schoolgirls , Western Zone Opens Country Championship, Sydney Women’s Second Grade for Penrith, gained her Cricket Australia Level One Accredited Coach and Baradine Sportsperson of the Year as well as completing her HSC. She has returned home to help her father on the family farm which is suffering financial hardship due to the drought. She hires herself out as a rouseabout to anyone in the district requiring help on their farms. I am honoured to be presented with this amazing cricket kit which will assist me in achieving my dreams of becoming a professional women cricketer and representing my state and country. I feel privileged to be also representing this wonderful foundation, the Nicole Fitzsimons Foundation and all that it entails. I will treasure this cricket kit, not because of the gear but because of the generosity and kindness that Julie, Kate, the Board and the rest of the foundation has given me. It is truly unbelievable and I am lost for words. I will always play to emulate Nicole’s passion and love for sport and life. The Nicole Fitzsimons Foundation has proudly assisted Aaron in his mission to overcome depression by supporting his passion to play tennis professionally again. 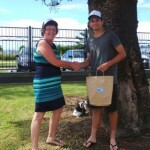 Aaron Macrae, an Illawarra boy was a passionate and talented young tennis player. At 15 years he was ranked number 1 for his age in doubles and 4 in singles. He won many titles from the age of 10 and at 14 received a two year sponsorship from Wilson. 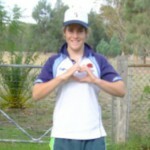 At 15 he made the Australian team to play in the Czech Republic but was unable to go due to financial hardship. Unfortunately Aaron then suffered a severe injury forcing him to stop play tennis for a few years which spiralled him into depression. Now 22 years old and fully recovered from injury, Aaron has regained his passion and confidence to compete again. He is training at Homebush 4 days a week and coaches students before and after school to support his training. On weekends he competes in country competitions to continue to improve his skills on the country. The Nicole Fitzsimons Foundation has proudly assisted Aaron by paying the entry into sixteen weekend competitions and provide petrol vouchers to travel to and from the comps. The Foundation look forward to following Aaron’s results as he re-ignites his dream to play tennis professionally. 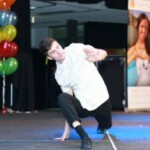 The Nicole Fitzsimons Foundation has assisted with his dream to study dance in New York.